Whether you’re using MapsIndoors as it is or need a customized enterprise solution, you’re always guaranteed a number of standard features that’ll make your indoor navigation solution stand out. 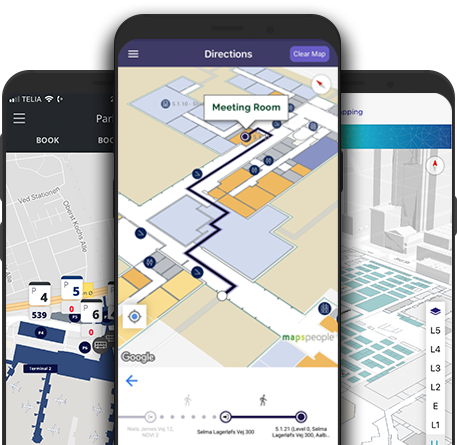 A good indoor navigation solution is user-friendly, intuitive, and familiar to the users so they only have to focus one finding their destination. MapsIndoors is uniquely built with Google Maps technology ensuring a well-known look and feel and we’ve made it even better by adding text based searches, offline routing, filters, and much more.We call it a solid foundation for your solution. MapsIndoors can be interfaced with almost any third party system to meet your specific need and we have extensive experience with a large number of systems. If you want to know more about integrations and get inspiration for your own solution, check out our integrations page.